David Wilcock and his team are inviting residents, business owners, property owners, schools, sports clubs, churches and organisations who are based, or use facilities in Newtown to take part in our first KEEP NEWTOWN CLEAN event on Saturday 6 July, from 8am to 12.30pm. 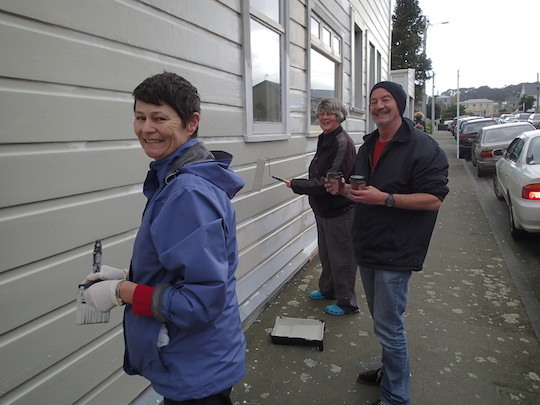 Newtown Residents’ Association, Newtown Business Group, Newtown Festival, Newtown Community and Cultural Centre, Wellington Timebank and Wellington City Council are all supporting the clean up day. Paint brushes, paint, gloves, rubbish bags and food will be provided on the day; just turn up with a group of friends or join a team and work together to clean up Newtown. The plan is to tackle all the tagging and discarded rubbish in Newtown, sending a clear message that we are proud of our cool town and that we will remove all tags. With the full support of our community we will have a zero tolerance to tagging – we can all make a difference and be proud of Newtown as a place to live, work and visit. Meet on Riddiford Street outside Newtown New World at 8am.